Structural health monitoring (SHM) is an important gadget for engineers to improve the safety and maintainability of various civil infrastructures. Structural health monitoring system comprises a wide range of sensing technologies to analyze a vast amount of real-time-data. The common parameters which are measured to analyze the sustainability of a structure include vibration and strains that are measured by various sensors, data analyzing systems, and hardware and software solutions. The system is designed to analyze and maintain the health of structure such as buildings, bridges, dams, wind turbines, stadiums, and large machineries. 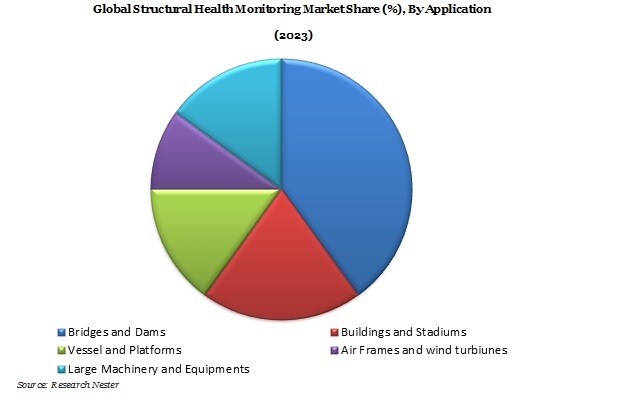 Structural health monitoring market is anticipated to project an exponential growth over the forecast period; the market is estimated to reach US$ 3 billion by 2023 witnessing a compound annual growth rate of 30% over the period 2016-2023. Bridges and Dams segment was valued at 0.48 billion US$ in 2015 and is anticipated to reach 0.55 billion US$ by the end of 2016 witnessing a compound annual growth rate of 15% over the forecast period. Bridges and Dam segment is anticipated to dominate the global SHM market over the forecast period followed by Buildings and Stadium segment as the calamities through theses infrastructure causes huge loss of lives and capitol. North-America is anticipated to contribute highest share in terms of revenue in the global SHM market followed by Asia-Pacific due to the developed infrastructure industry across the region. North America region is anticipated to account for 30% share of the global SHM market by the end of 2016 while Asia-Pacific is anticipated to contribute 20.2% to the global SHM market in 2016. Wide availability of low-cost sensors being used in structural health monitoring systems, growing infrastructural development across the globe, increasing awareness of governments towards the maintenance of heritage structure in order to boost the tourism revenue of their country, government regulations to reduce the loss of lives through regular maintenance of public infrastructure are the main factors driving the structural health monitoring systems market across the globe. Use of SHM systems during the construction of an infrastructure will help in identifying the inadequacy in its construction and design, new government regulations towards the compulsory implementation of SHM systems in order to reduce loss of lives as well as cost will boost the SHM system market in the coming 5-6 years. In conventional SHM systems, data is collected manually through implementing of sensors on the infrastructure, now the high-tech systems consists automation systems which reduces the cost of maintenance. Non-destructive monitoring, non-contact vibration measurement systems are some new trends improving the SHM accuracy. Cost-reduction due to the technological advancement of the SHM systems is anticipated to be the key factor driving the SHM market over the forecast period i.e. 2016-2023. High-cost, inaccuracies in the measurement, lack of expertise, alternate methods of monitoring are some factors restraining the market growth over the globe.